Thursday morning began with a round of Bang! the Dice Game, in which a group of good guys and bad guys attempt to shoot each other down, except no one knows which team they're on. I was Black Jack--an outlaw, this time around. But the sheriff prevailed. Next up was the first marquee game of the event, Wits & Wagers. We started Wits & Wagers at G&G X, and each year since, a different member of the group has come up with the questions and served as manager of the game. This time around, Rob presented the questions. He did such a good job that I only snapped a couple of photos of the game. Here, Steve, Scott, and Mike prepare. Up next was Fortune & Glory, now with painted miniatures! I spent the better part of a year painting each of the two dozen or so 28mm figures, and while they're not great, they're better than unpainted! I find painted minis really help with immersion. Fortune & Glory is a 1930s pulp adventure game with a really nifty cliffhanger mechanic, but it suffers from a badly organized rulebook. Luckily, Steve found a fan-created rulebook on Board Game Geek; we used that in a playtest a couple of months before G&G, and we found that it really improved the game's pace. Poor Pete and Jeff still found up stuck in a jungle for four or five rounds though, much to Jeff's frustration and our amusement. 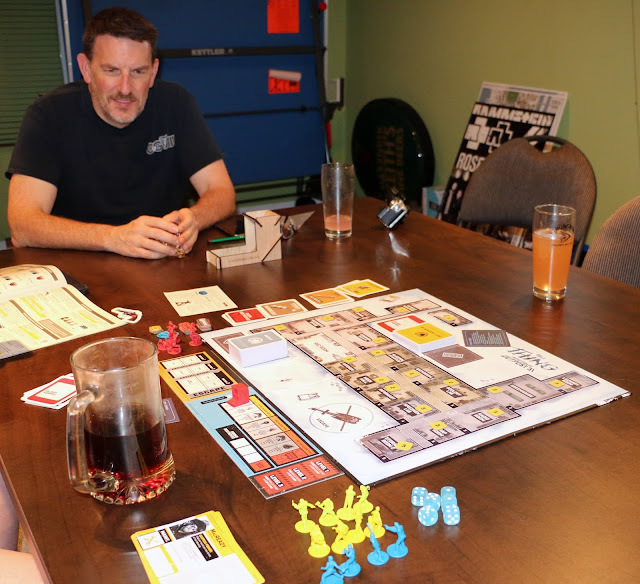 Paranoia ruled at our next marquee game, new to G&G: The Thing: Infection at Outpost 31. Based on the John Carpenter's brilliant 1982 film, The Thing casts players as the characters of the movie...but one of them is actually The Thing, and he's out to infect the other players before they can escape on the helicopter. The Thing won, dooming humanity. "I'm going to be stuck in the jungle this entire game, aren't I?"